The heightened interest in developing cancer treatments, combined with the R&D efforts put forth over the past decade contributed to the emergence of a class of “smart bombs” first reported as one of their most hopeful developments at the American Society of Clinical Oncology’s annual meeting in June of 2012. These medicines use antibodies, which bond to specific cancer cells, to deliver a very toxic drug directly to the cancerous cell, leaving healthy tissue alone. In February of 2013, the FDA approved the first of these “smart bombs” to treat breast cancer, commercially known as Kadcyla and developed by Roche’s Genentech. The second major development reported at the time was some degree of success in using the body’s own immune system to fight cancer; an idea that has been around for a century, but training the immune system to recognize the cancer cells as an “enemy” to attack had previously been met with limited success. At present, there are still no FDA approved drugs on the market that work using immunotherapy, but evidence from clinical trials testing PD-1 (a protein) blocking drugs have shown a “quantum leap” of progress. * These potential new kinds of therapies, combined with progress in diagnostic tests that will help predict which medicines will work for which patients are important tools in reducing cancer deaths and carry huge potential for the developers who bring them to market. Eighteen oncology drugs were approved in 2012 (of 50 new drug approvals, including NMEs and BLAs), twelve in 2013 (of 41) and one so far in 2014. This percentage has remained steady for the past few years, where oncology drugs comprise roughly one-third of the new drugs approved, with 36 percent in 2012 and 29 percent in 2013. The large number of medicines being developed for oncology is no surprise, as cancer is still a leading cause of death in the United States, second only to heart disease. The vast market for cancer medicines has secured its position as a therapeutic area of focus for the drug development pipelines of 38 percent of all pharmaceutical and biotechnology businesses — up five percentage points in the past three years. In looking at the different sponsor segments, the data show that 53 percent of Big Pharma companies have oncology drugs in their development pipeline, up from 45 percent in 2012. Big Biotech follows with 37 percent, a slight drop from the 40 percent in 2012. Specialty pharma and emerging biotechs have ramped up oncology drug development, with a six-percentage point increase over 2012, both rising from 29 percent up to 35 percent. Emerging Pharma companies had the smallest increase in developing oncology drugs, with a three-percentage point increase from 18 to 21 percent. 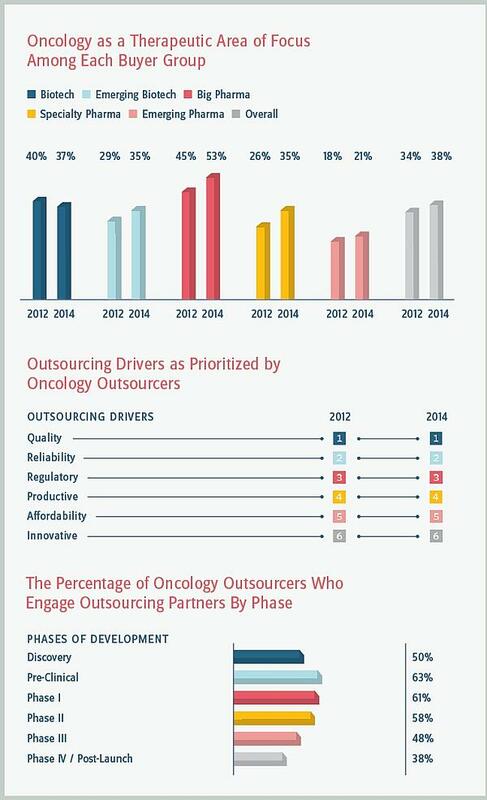 The results from the Nice Insight pharmaceutical and biotechnology outsourcing survey show that sponsors whose pipeline includes oncology medicines have broadened the base and are looking to outsource projects across an average of 3.5 different therapeutic areas of focus, up from 2.25 in 2012. These respondents were identified as heavy outsourcers in 2012, averaging 6.9 different services, as compared to the overall average of 5.3. 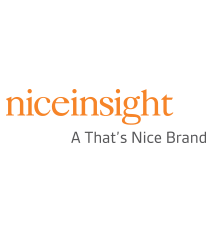 This continues to be true, and has shown solid gains, with an average of 8.5 different services outsourced as compared to the overall average of 6.4. This heavy outsourcing is still accompanied by substantial outsourcing expenditure; however, spending is not quite as high as it was in 2012 where 41% of businesses whose therapeutic area of focus is oncology diseases indicated they would spend more than $50M, as compared to 26 percent of the overall respondent group. In 2014, this number decreased to 34 percent, as compared to 24 percent of the overall respondent group. In 2014, 45 percent indicated their expenditure would be between $10M and $50M, as compared to two years ago when thirty-six percent fell into this category. The percentage of respondents in the lowest spending category remained the same — at 22 percent — from 2012 to 2014. These traits — significant expenditure and heavy outsourcing — give the group considerable influence over the market size of the services they outsource. For this reason, among others, it pays to gain some traction in this therapeutic area. Four out of five respondents prioritized a CMO’s “Track record / History of success” with the highest level of importance when considering an outsourcing partner. Further, therapeutic experience adds appeal to a CMOs position as a strategic partner.